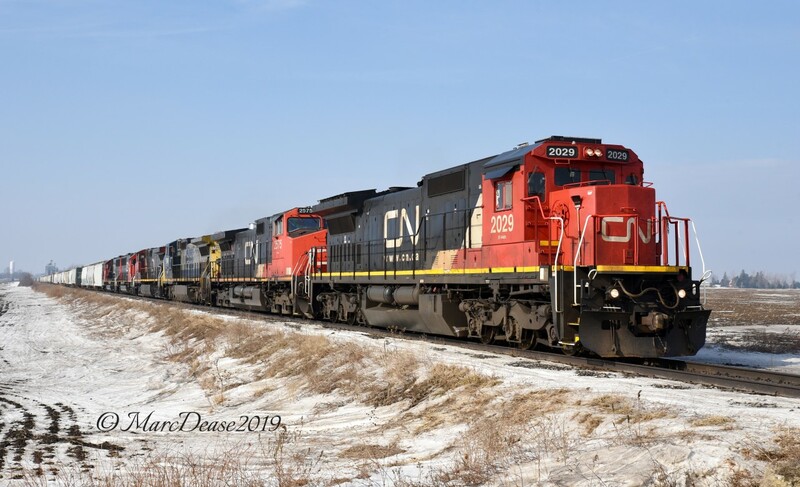 Railpictures.ca - Marc Dease Photo: A rather large lash up on 394 with CN 2029, CN 2575, GECX 7349, IC 2707, CN 5409 and CN 5404 as pass east through Wyoming, ON., on a very frosty morning. | Railpictures.ca – Canadian Railway Photography – photographie ferroviaire Canadienne. Caption: A rather large lash up on 394 with CN 2029, CN 2575, GECX 7349, IC 2707, CN 5409 and CN 5404 as pass east through Wyoming, ON., on a very frosty morning.